For the past few years, I have committed, heart, body and soul to the pursuit of my graduate degree in archaeology. I know many people in pursuit of their degrees would choose to study a fascinating subject, with the potential to change the world; but being the go-getter that I am, I chose the blood-racing world of dental microwear analysis. My focus, specifically, was in applying the study of dental microwear to bison from sites in southern Alberta to determine which seasons those sites were occupied (the site’s seasonality). 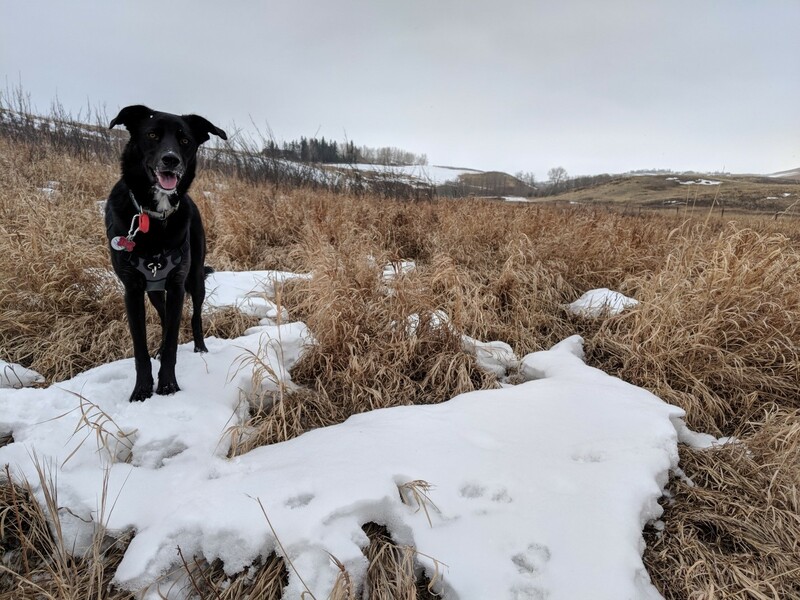 Albus, helping me observe the seasonal trends in grass growth on one of my regular visits to Glenbow Ranch Provincial Park. The analysis of microscopic patterns on teeth has been useful to several fields, including archaeology. The method can provide information about an animal’s diet immediately before death, allowing researchers to reconstruct past environments and determine the season that an animal died. This is based on the recognition that different types of food produce identifiable features on the enamel of teeth.